Rune, a new foal at Idle Moon, imprinting and the future…. Five weeks ago, Glasswing’s foal, Rune, was born. Sara and I were there at her birth to towel and dry her off, dip her umbilical stump in iodine and make sure she found Glasswing’s udder for her crucial first colostrum. It was a brutally cold evening, -18 by midnight, and we wanted to give her every chance to thrive. She was long-awaited and much wanted. Before Rune, I always imagined that my mustangs were as pure of a slate as you could find in a learner. They grow up free and only have limited experiences with humans when gathered and then adopted out. Otherwise, their opinions of humanity and learning are ours to shape. But seeing Rune, meeting her hoof by hoof as she entered this world, I realized she is even more of a blank slate than my mustangs. She will grow up immersed in relationship to humans. Every day, every interaction, she will be learning. As my favorite writer, Jeanette Winterson, writes, “This was the edge of time, between chaos and shape. This was the little bit of evolution that endlessly repeats itself in the young and new-born thing. In this moment there are no cars or aeroplanes. The Sistine Chapel is unpainted, no book has been written. The moment between chaos and shape and I say her name and she hears me.” Everything is yet to be decided. Everything is possibility. A foal is a chance to begin again, tabula rasa. What should we teach? What is important in the beginning? Often, a foal’s relationship with humans begin moments after birth through a process called “imprinting” developed and promoted by Dr. Robert Miller, DVM. “Miller begins the imprinting process by kneeling in the straw, or on the ground, with the foal’s back against his knees and the head flexed so that the foal is unable to get to its feet. He controls the head by grasping the youngster’s muzzle, careful not to obstruct breathing in either nostril, and tipping the nose back toward the withers. It is important to keep the foal’s back to you, says Miller, in order to prevent being kicked if the youngster should lash out with front or rear feet. With the foal in that position, Miller towels it dry, all the while allowing the mare to sniff and lick her offspring. Once that is done, he begins the desensitization process. From there, Miller begins a process of flooding the foal with tactile sensations (fingers in the ears, mouth, nostrils, mouth, etc) systematically all over it’s body until it shows no reaction/stops struggling and then moves to rubbing down with plastic bags, a blow dryer, a vibrating clippers and other novel stimuli. All of this happens before the foal is allowed to stand, suckle or spend time alone bonding with it’s mother. Over the next few days, the process is repeated once or twice. 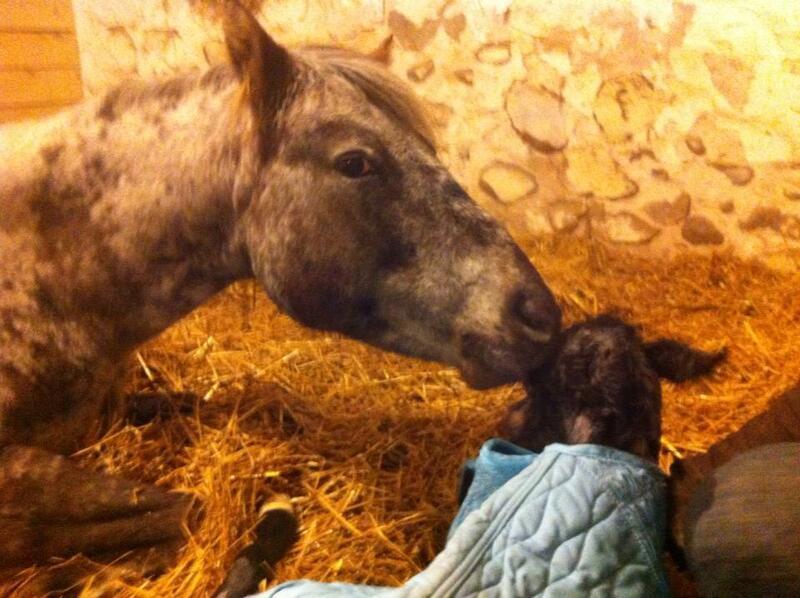 The theory is that foals are in a limited critical learning period in the first few hours after birth. The premise maintains whatever stimuli is presented to them within that window will be accepted as routine and non-threatning throughout the duration of their life. The technique is essentially presented as a shortcut to a relaxed, easy to handle adult horse. We did not imprint Rune. The entire process interrupts bonding time between mare and foal, and puts undue stress on both. Every animal deserves social, private time with it’s own baby at birth. It is a human conceit, I think, to consider another species’ baby our own and to begin training it before it has even gained it’s feet in this world. New born foals have powerful survival instincts that cause them to struggle against restraint and to pull away from novel stimuli. Eliciting these survival instincts in the name of training and then overpowering these foals with brute strength teaches them powerlessness as their first lesson in relation to a human and powerlessness in relation to their own new body. We need to ask ourselves why this lesson seems attractive or necessary. To me, it is troubling and reflects a lack of imagination. As for Rune, we made sure she was born safely and was dry and warm. When she had trouble standing, we supported her a bit at her shoulder, so she could lean and get some traction to stand. When she had trouble finding the udder, we guided her gently so she didn’t waste too much energy on that very cold night looking for food. We acted as friends and guides, the same role we will play for her in the future. Once she was dry, able to stand, able to eat, and had pooped (important with foals to know digestion is working), we left her alone to bond with Glasswing. To be a young filly learning about being a horse from her mother, another horse. Yes, there are a million things to learn about being a horse in a human world, but those things can wait. As many great horse people have said, “Things take the time they take.” There are years before Rune can be ridden, years to be filled with learning about brushing, clipping, coordinating motor responses with a human request, leading, and learning to be still. But right now she needs to how to buck, how to canter, how to rear and express joy and power through her own body. Nothing is more enchanting than a young animal learning to move, learning to balance, learning the limits and outer edge of gravity. I want her to feel infinitely powerful, so later, she can share that power with me through riding. I want her to know she has choices, because control over your environment is crucial for security. I want her to be free to be a baby animal with all the emotionally impulsive wild disorganized movement that goes along with being young. And I want her to learn, over time and through daily interactions with me, that humans are safe, enjoyable, consistent and wonderful teachers. I am reaching toward a world where instead of holding foals down and teaching them not to struggle, we help them stand for the first time and celebrate their arrival, because we know there are kinder and more ethical ways to build cooperation. A world where we both respect the species specific relationships animals are born into and take the responsibility of truly creating our own individual relationships and behavioral agreements with them based on systematic positive reinforcement. I am embarking on this amazing journey with Rune and I can’t wait to share it with you.